A couple years back my I took my wife, father, and oldest children to an auto show/flea market/local charity fundraiser event. You know the kind: hot day in summer, smoke from various grilled meat stands, flies, and a range of stuff for sale from immaculate to junk. 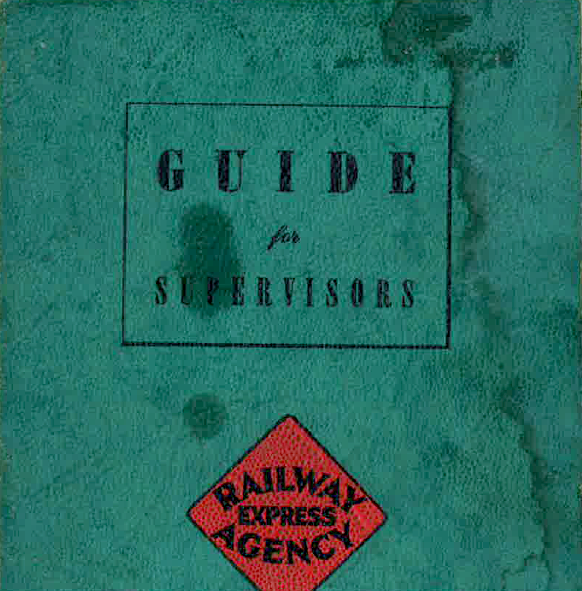 On one of those ubiquitous junk tables I found a Railway Express Agency "Guide for Supervisors" for sale for just six bucks. Yep. Six dollars. You bet I picked it up. Flipping through pages to see what knowledge REA had for supervisors in 1943, the publication year, I was impressed. REA claimed to move anything that would fit in an express car: dogs and cats, blood plasma, jewelry, bonds, oysters, neon signs — there's even a cartoon drawing of a large statue in a museum, wrapped and ready to ship. There's a section on hiring new employees (two pages only). REA devotes four pages on the qualifications to be a supervisor, including: "A good supervisor will: ... Be open-minded; always willing to listen to a grievance and ready to discuss it thoroughly and sympathetically." "Express implies speed. If shipments entrusted to the Company are delayed, the term loses its significance and the Company pays claims for deterioration or destruction of production, missed markets, lost sales and lower prices. The solution of the problem is in the hands of the Supervisors." 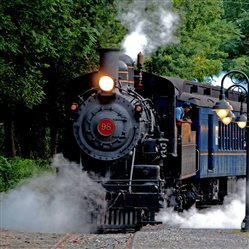 Although the modern equivalent of REA is FedEx, UPS, and DHL, among others, the sentiment rings true for modern-day railroad shippers. There's a discussion of taxes (that are too high compared to 1929); how to properly lift a box, and how to maintain good company-labor relations. In short, for $6, I had an interesting reminder that there's nothing new under the sun, AND, that those people running shipments on 10,000 trains a day were pretty advanced, considering they kept track of everything with paper and pencil. What celebrities might show up to watch Big Boy this year?